Now I know what you're thinking, why would a vegan blogger be reviewing a carvery? 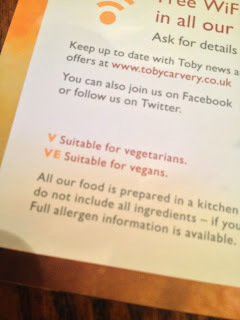 Well, yesterday I went out for my Sunday Roast at Toby Carvery and was very pleasantly surprised to find out they have a vegetarian menu of which two of the main courses are vegan and labelled so on the menu. 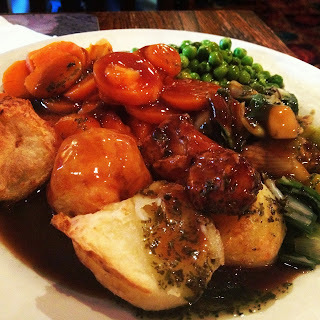 In addition to these two vegan main courses - Shepherd's Pie and Nut Roast Wellington, most of the carvery vegetable options are vegan too - excluding the mash potato, Yorkshire pudding and cauliflower cheese. For example, yesterday I had peas, carrot, red cabbage, onion, roast potatoes, leeks, stuffing, gravy and mint sauce along with my Nut Roast Wellington. The veggies are unlimited as is the gravy and sauces and they come in with the price of your vegan main meal. 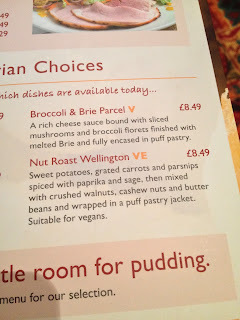 I checked with the chef and all of the veg options apart from the exceptions above are vegan, and they even brought my Nut Roast to the table so as not to cross contaminate. The prices are good value with the vegan options priced at £5.99 on a weekday and at £8.49 on a Sunday. They also have a weekday 'Meat-free Carvery' option for £4.49 which is just the unlimited veg. 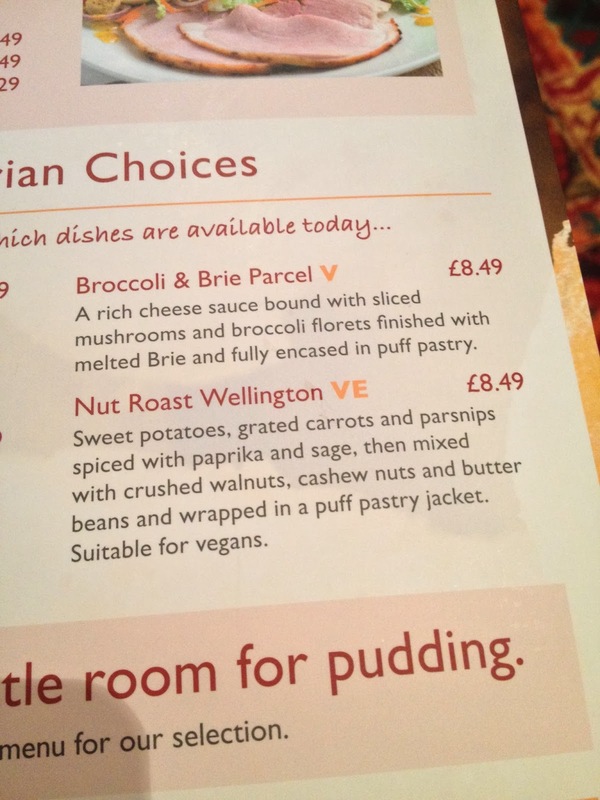 Yesterday I had the Nut Roast Wellington and Mr Vox had the Shepherd's Pie so I could try both options. They were both delicious! 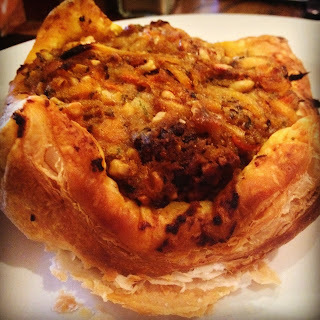 The Wellington had a mildly spicy nut roast mix on top of a puff pastry base and the Shepherd's Pie was root vegetables with a bubble and squeak mash on top. Really tasty and they know about veganism and had knowledgeable staff. 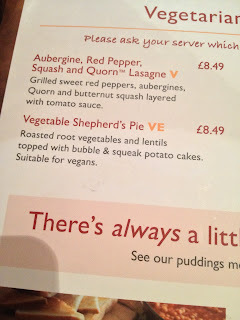 For those who are vegetarian or like me have a vegetarian family member, there are five main vegetarian options on the menu and all of the desserts are vegetarian too, although sadly none of the desserts are vegan. 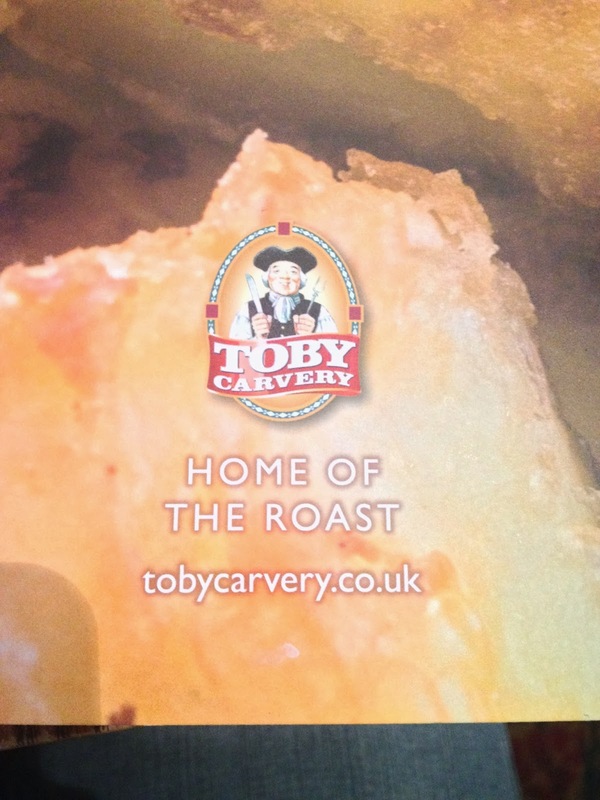 It is great to see a chain restaurant start to make positive changes to include a variety of vegan options on their menus and as there are many Toby Carvery restaurants dotted around the country, it is useful to know if you are away from home and looking for a meal option. It also makes a good compromise if you are dining out in a large group which includes omnivores, vegetarians and vegans as you can all eat together with choices and options for everyone. If home cooking is more your style, pop back tomorrow for another Vegan Recipe of the Week. Wow that looks really yummy! Good to know that they offer vegan options I'll have to find one nearby and encourage it! I've just been to a Toby carvery and had the delicious nut wellington, but I asked at the veggie counter and they said all veg was cooked with butter. They did then cook me a separate portion of veg. Turned out the roast potatoes are vegan but I'm seriously questioning how the puff pastry is madenif they don't warn about veg cooked in butter. I did get a reply from them, and they said it is up to each head chef whether to butter the vegetables or not, however, if the chef at your local branch does butter the veg, they will make you up a plate of steamed veggies to go with your vegan main and bring it out to your table. I get a bit panicky about the gravy, is it definitely veggie/vegan? The vegetarian gravy is vegan. This has been checked with head office, their website and the chef in our local branch.